Business cards at an entirely new level. Any designer will tell you that a great business card communicates a whole lot more than just your contact details. These three companies took it to another level entirely with business cards so good you might just consider a career change. Lego directors and PR managers have 'business cards' that are personalised mini Lego figurines of themselves. Each figurine displays the employee's name on the front of their t-shirt and their contact details on the back. These are almost more of an enticing promotion perk than a pay rise! Why it works: The mini figurines show off the company's product, serving as an advertising tool in addition to being a networking tool. Given that their existence managed to go viral, it seems they've served those purposes fairly well! 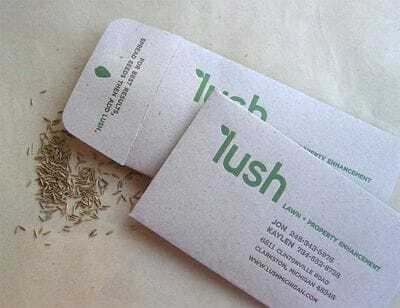 Lush Lawn + Property Enhancement's letter-pressed cards, which are beautifully designed, open up to reveal grass seeds for potential clients to plant. And on the back of the packet it reads, "For best results, spread seeds then add Lush." Why it works: Lush ticks all the boxes here. The cards share the brand message in a meaningful way, they're memorable, practical and they function perfectly as a traditional card. With an execution that proves usefulness reigns supreme, Brazilian cheese shop Bon Vivant offered up a business card that doubled as a cheese grater! The cards were so popular that the store's owner, Beto Rogoski, said they had to establish a rule whereby customers receiving a card had to wait a few days before taking another. Why it works: The practicality and novelty factor mean this one won't be thrown away any time soon, and the ad agency responsible for the idea (JWT) was clever enough to store the mini graters in a protective sleeve to stop them from ruining wallets or back pockets. To design and print your own business cards, contact your local Snap Centre.